Happy Tuesday dolls! I'm going to be a bit MIA the next few days since I'll be offsite doing a photo shoot for work but I'll try to read and respond to comments when I get a break! I don't know about you but all the pictures of people at Coachella the past two weekends really made me want to go next year! It was extra hard for me since I had a friend out there who was snapping the most fun Snaps all weekend totally giving me FOMO (thanks Yass...). Since I couldn't be there I decided to rock a festival inspired outfit around town to compensate. Don't get me wrong, if I was actually at Coachella this definitely wouldn't be what I was wearing but since I'm on a no-spending month (4 more days!!! I'm not counting down or anything) I put together a quick outfit based off of what I already had in my closet to feel semi-festival ready. I got this kimono last year and wore it to many, many brunches then put it away for winter and was super excited to break it back out again. I love the flowy sleeves and the fun paisley pattern at the bottom. For this look I threw on a simple black tank (which happens to be one of my favorites!) and a pair of high wasited shorts. Because I was out running around I kept it simple with my super comfy DV espadrilles which I'm not too proud to say, I own in both colors! The DV line for Target is seriously killing it! I think I own 4 pairs of shoes from the line now... and each one is super comfy! I looooove kimonos and the print on this one is really great. Love how you paired it with the espadrilles, you look great! I see why you wore the kimono lots last season--it's beautiful! Love this look! I just got 2 new kimonos this past weekend that I can't wait to wear all summer! I totally have Coachella FOMO too! It looks like so much fun and I would totally love to go one year. Your outfit would be perfect! I wish FL wasn't sooooo far away from it otherwise I would totally figure out a way to go. Love a good kimono it just works for so many things. I'm all about the kimono's right now - so cute and easy! Hope your week isn't too rough! Love this! You would've totally fit right in, and I need your shoes!! Such a great summer outfit combo. I love the shorts with the kimono. 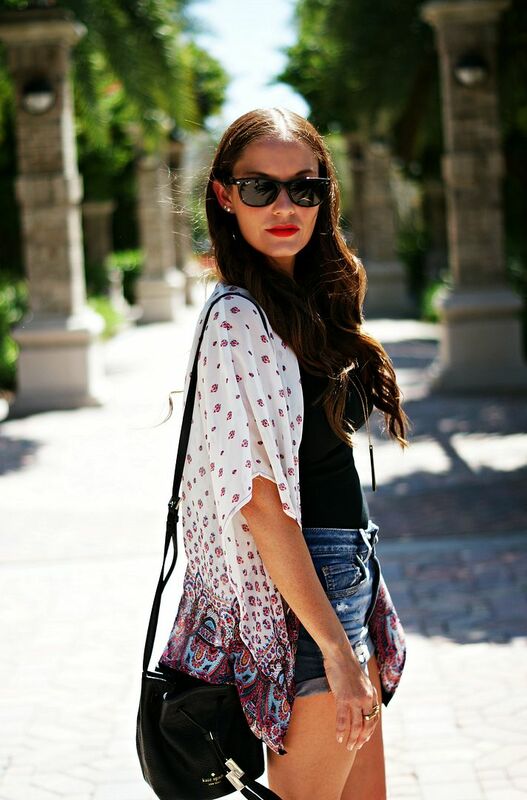 Cannot beat a kimono + jeans shorts combo- love this look, babe! I love that kimono on you, perfect for a concert or festival! oooh pretty and i love the paisley print at the bottom :) i'm with you, all those snaps and pictures from celebrities totally made me want to go next year! You definitely look like you could be walking around at Coachella in that outfit! So cute! I love how you styled it with the high waist shorts! They're so cute! I love kimonos, this is so cute with the shorts! Don't you love when you have an old item that you can break back out with?? Love the colors! Coachella pics always intrigue me. I love your kimono (and am taking cues on how to wear mine!). So cute paired with the flats! I love this look! I am going to copy it for Jazz Fest this weekend! I LOVE a good kimono for the summer, I just picked another one up recently and it's seriously so versatile. It can be used to pair with a cute outfit or as a swim cover up! All the snaps and photos had me really wishing I was there too but love kimonos right now too! Such a cute festival look! Love that fun kimono and I totally wish I was at Coachella too! Love this look! You'd totally fit in over here with the kimono, I see them sold everywhere! this is really cute! Kimonos always look so good on everyone and whenever I try one on I feel like I"m just lounging in a robe. I don't get it. Love the way it's utilized here. I love that kimono! It looks so perfect with this outfit!